At a simplistic level, using DC motors is pretty straightforward -- you put power in, and get rotary motion out. Life, of course, is never this simple -- there are a number of subtleties of DC motor behavior that should be accounted for in BEAMbot design. This is the simplest trait to understand and treat -- most DC motors run at very high output speeds (generally thousands or tens of thousands of RPM). While this is fine for some BEAMbots (say, photopoppers or solarrollers), many BEAMbots (walkers, heads) require lower speeds -- you must put gears on your DC motor's output for these applications. Just as putting voltage across a wire in a magnetic field can generate motion, moving a wire through a magnetic field can generate voltage. This means that as a DC motor's rotor spins, it generates voltage -- the output voltage is known as back EMF. Because of back EMF, a spark is created at the commutator as a motor's brushes switch from contact to contact. Meanwhile, back EMF can damage sensitive circuits when a motor is stopped suddenly. A number of things will cause a DC motor to put noise on its power lines: commutation noise (a function of brush / commutator design & construction), roughness in bearings (via back EMF), and gearing roughness (via back EMF, if the motor is part of a gearmotor) are three big contributors. Reality is a bit more complex than this, as even a high-quality motor will display a current transient at each commutation transition. Since each coil has inductance (by definition) and some capacitance, there will be a surge of current as the commutator's brushes first touch a coil's contact, and another as the brushes leave the contact (here, there's a slight spark as the coil's magnetic field collapses). In this case, the peak-to-peak current ripple is approximately 0.29 mA, while the average motor current is just under 31 mA. So under these conditions, the motor puts about less than 1% of current ripple onto its power lines (and as you can see from the "clean" traces, it outputs essentially no high-frequency current noise). Note that since this is a 3-pole motor, and each coil is energized in both directions over the course of a rotor rotation, one revolution of the rotor will correspond to six of the above curves (here, 6 x 2.4 ms = 0.0144 sec, corresponding to a motor rotation rate of just under 4200 RPM). Motor power ripple can wreak havoc in Nv nets by destabilizing them inadvertently. Fortunately, this can be mitigated by putting a small capacitor across the motor's power lines (you'll only be able to filter out "spikey" transients this way, though -- you'll always see curves like the ones above being imposed on your power). On the flip side of this coin, motor power ripple can be put to good use -- as was shown above, ripple frequency can be used to measure motor speed, and its destabilizing tendencies can be used to reverse a motor without the need for discrete "back-up" sensors. 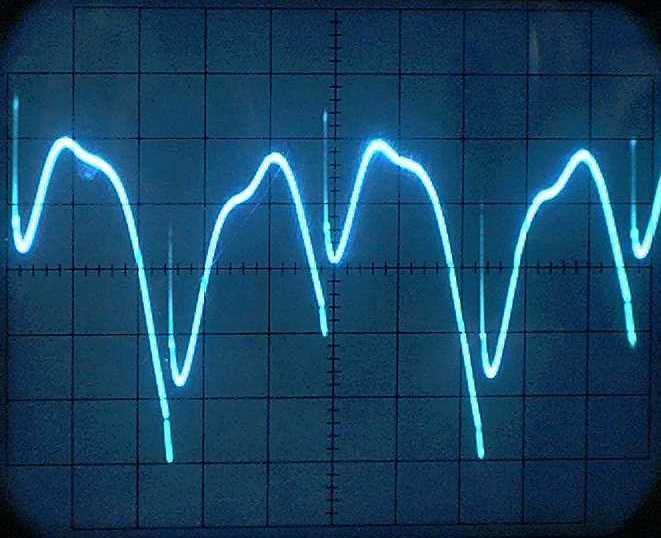 To scope out what motor is best for a given BEAM application, we'll need to do some math -- let's move on to DC motor performance parameters.